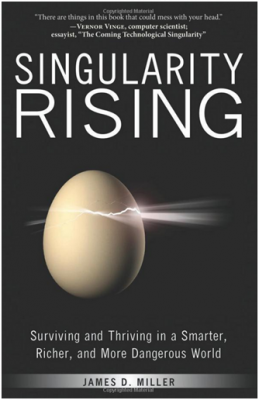 Singularity Rising: Surviving and Thriving in a Smarter, Richer, and More Dangerous World focuses on the implications of a future society faced with an abundance of human and artificial intelligence. James D. Miller, an economics professor and popular speaker on the singularity, reveals how natural selection has been increasing human intelligence over the past few thousand years and speculates on how intelligence enhancements will shape civilization over the next forty years. A merger of man and machine making society fantastically wealthy and nearly immortal. Competition with billions of cheap AIs drive human wages to almost nothing while making investors rich. Businesses rethink investment decisions to take into account an expected future period of intense creative destruction. Inequality drops worldwide as technologies mitigate the cognitive cost of living in impoverished environments. Drugs designed to fight Alzheimer’s disease and keep soldiers alert on battlefields have the fortunate side effect of increasing all of their users’ IQs, which, in turn, adds percentage points to worldwide economic growth. Singularity Rising offers predictions about the economic implications for a future of widely expanding intelligence and practical career and investment advice on how you can prepare and flourish in a singular environment.